Folks, this is one of the things about Kentucky that I miss the most. Well, it really doesn't matter what state you live in, you can garden. But, it's one of the things about MY time living in Kentucky (my home state) that I miss. Since I now live in Massachusetts, and live in an apartment, what is a cheap way that I can get back into gardening? Please keep in mind that I do not have anywhere outside the apartment to put pots, etc. Most certainly, though, I can not use the landlord's yard to start digging up rows. Am I going to have to get grow lights? The apartment has four windows in the room (my bedroom) that I typing in, a window in the middle room (more of a foyer), and two windows in the kitchen. That's it for windows. I just really miss growing tomatos, beans, peas, etc. I can't help you much with the indoor stuff... but the town you live in, do they happen to have "Community Gardens" ? I know some cities do and our village has 2 of them. Great way to garden if you dont have a yard. Does you apartment building have a flat roof? That has been a traditional gardening spot for city dwellers..as long as there is safe access and room for pots. Otherwise a community garden would be your best bet. Or perhaps if you join a gardening club you can partner with someone nearby that has an existing garden space to share. 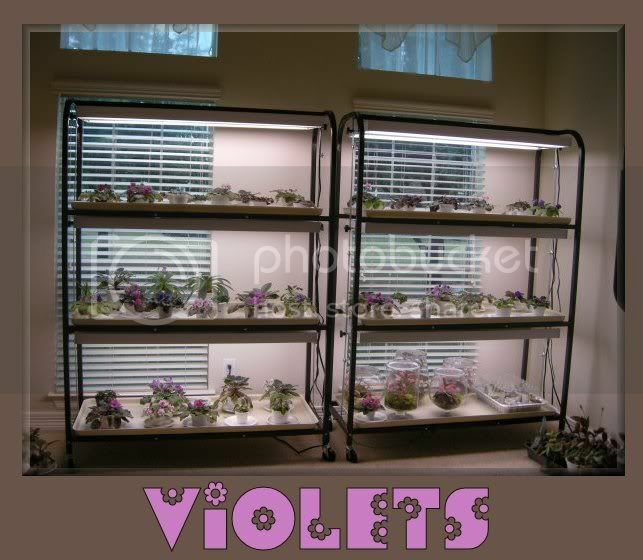 You can grow violets, orchids or indoor plants with lighted stands. I would grow herbs inside with a grow light. "The Google" can probably show you many ways of doing it. Don't buy one of the "herb kits," though. Use good potting mix and grow from seed. We made our own setup relatively inexpensively. It helps us get the gardening ya-ya's out, AND we have fresh herbs!!! You could become a "guerrilla gardener", just find a empty plot of city owned or abandoned property and start planting, buy one of those bright yellow vest that highway workers ware and everyone will think you are supposed to be doing what your doing. Here's a web site of other people doing this around the world. I just checked out the Guerilla Gardening Homepage! Freaking fabulous! It's a whole new level of Monkeywrenching. Here is an idea for apartment gardening. Orchids. way cool. There is bound to be an orchid club near you. See if they can give you pointers. sounds fascinating, but the link is down.